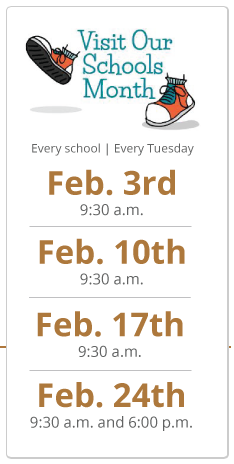 Community members, businesses and parents are invited to visit any ASD school during the month of February to learn more about the community’s public schools. While schools welcome members of the public year-round, this coordinated effort provides parents and community members an opportunity to learn more about the many educational opportunities available. During the inaugural Visit Our Schools Month event in February 2014, ASD schools welcomed 1,607 visitors. The safety of our students will always remain our top priority. All people on tours will be checked in through normal procedures that visitors follow. Principals and school staff will be leading the tours and tour groups will never be unsupervised. Students will continue classroom activities during tours and the tours will not interfere with student learning. Please visit ASD’s Frequently Asked Questions page for more information. The Alaska Department of Transportation and Public Facilities (DOT&PF) and co-sponsors including the Municipality of Anchorage, Anchorage Police Department, Anchorage Water and Wastewater Utility invites you to participate in the 2015 Anchorage Transportation Fair. The event is a “super open house” providing attendees a one-stop showcase of transportation projects, planning efforts or existing plans concerning all modes of transportation within the Municipality of Anchorage. When: Wednesday, February 4, 2015, 4 p.m. to 8 p.m.
3550 Providence Drive, Anchorage. Free parking. Scenic Foothills Community Council meeting 7 p.m. Thursday, February 5, at Wayland Baptist University, 7801 East 32nd Avenue. Chugach Foothills Park playground concepts and council bylaws updates will be on the agenda. The February newsletter is here and the SFCC website is here or find us on Facebook. Muldoon Farmers’ Market Organizational Meeting 7 p.m. Monday, January 12, at the Muldoon Community Center (Muldoon Boys & Girls Club), 1251 Muldoon Road. The meeting will be to brainstorm a name for the market, a theme, a location, social media, and merchant participation. The meeting is open to anyone who might be interested.